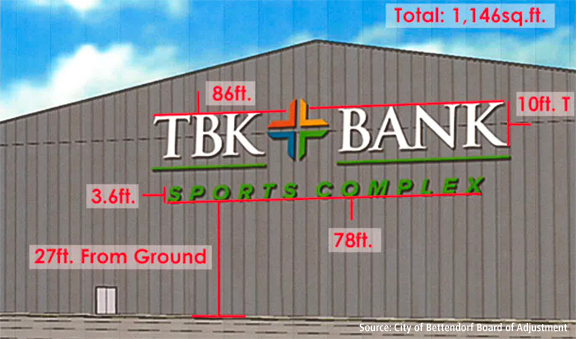 The sign design provided city planners shows the building wall facing I-80 would have a 10-foot high logo of TBK Bank, with 3.6-foot letters under the logo saying "sports complex." The variance application says the larger sign is necessary because vehicles traveling along I-80 will be 1,400 feet away from the sports complex. Doug Kratz, developer/owner of the sports complex, has been on the board of directors of Triumph Bancorp, the Dallas-based parent company of TBK Bank, SSB, in Bettendorf, since 2013.